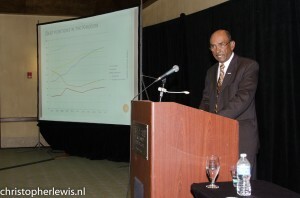 PHILLIPSBURG, WILLEMSTAD - Financial supervision contributes to sound public finances, which in turn will lay a solid foundation for sustainable growth, is the line of thought Mr. Richard Gibson brought about at the occasion of the trade mission congress: ‘Connecting sustainable businesses from the Kingdom of the Netherlands and the Caribbean region’. This congress was held on Thursday May 22nd in Sint Maarten in the context of 200 years of Kingdom. Mr. Gibson, member of the Board on financial supervision (College financieel toezicht - Cft) for Sint Maarten, also pointed out which advantages the Dutch Kingdom has to offer to the young countries Sint Maarten and Curaçao. Going back in time Mr. Gibson illustrated how staggering debts almost brought the Netherlands Antilles to a financial collapse. Together with the political restructuring of 2010, a debt relief program made available by the kingdom brought a solution to this profound problem. Starting new autonomous countries with an inheritance of a 90% debt to GDP ratio was simply not realistic. This debt relief also brought into existence the Board of financial supervision (Cft). Supervision identifies the risks, and confronts the country’s decision makers with questions regarding these risks and the obligations they have to their own people. The relative stable debt position that Curaçao and Sint Maarten enjoy today and their access to capital at very low interest rates to develop their economies is a clear result of the existence of supervision. Recent economic research of the World Bank and the IMF has proven this. First of all, debt levels above 35 to 40 % of GDP in small island states like the Caribbean countries are a threat to sustainable economic development. Secondly, international comparisons of countries that have some form of supervision over countries that lack supervision prove that financial supervision is necessary for healthy economic development. Nowadays, almost four years later, no country in the region has debt levels as low as Sint Maarten and Curaçao. A healthy government with a low debt position instills confidence in investors and the population at large. Investors need trust in the financial and political stability of the government, and this has been achieved by Curaçao and Sint Maarten. The value of those factors for economic development can hardly be overstated. The question is whether supervision should be carried out by organizations within the country itself. According to Mr. Gibson independent budgetary supervision is of the essence but every country should work on its own checks and balances. Financial management is essential, and supervision of the budget needs to be carried out by parliament, sustained by internal accountants and the audit chamber. These three institutions are crucial for proper internal supervision. The effectiveness of institutions in Sint Maarten and Curaçao however needs to be improved. Annual examinations of the state of financial management based on the international Public Expenditure and Financial Accountability framework show that the supervision on the budgets and annual accounts by the parliaments is below standard. Reports of the audit chamber and recommendations of the corporate governance councils are not being dealt with adequately. Four years is not enough time to achieve the necessary improvements, but really independent supervision is hard to achieve even in time. For supervision to function it has to be absolutely free from political influences. The countries should avoid putting new weak institutions on top of already existing weak institutions. Making use of the possibilities the kingdom has to offer is a better option; the Cft and the financial stability it brings to the countries is just one of the advantages of being part of the Kingdom. In addition, more can be done with the unique capacities of the Kingdom of the Netherlands, to achieve more economic development and to build up new institutions together. The countries in the Kingdom are fragile and dependant on each other. However, parties need to learn to know each other better, and increase their level of trust towards each other. With sound public finance and optimized use of the benefits of the Kingdom, the young countries Sint Maarten and Curaçao can truly take advantage of economic opportunities and reach their potential. But they have to do it themselves. The autonomous status of the countries means that no one can be blamed anymore if times are rough. Economic development requires fierce entrepreneurship. In this regard, lessons can be learned from surrounding countries such as Panama and Columbia which are doing well: both countries have been outperforming the region in recent years with impressive growth rates notwithstanding the worldwide economic downturn.